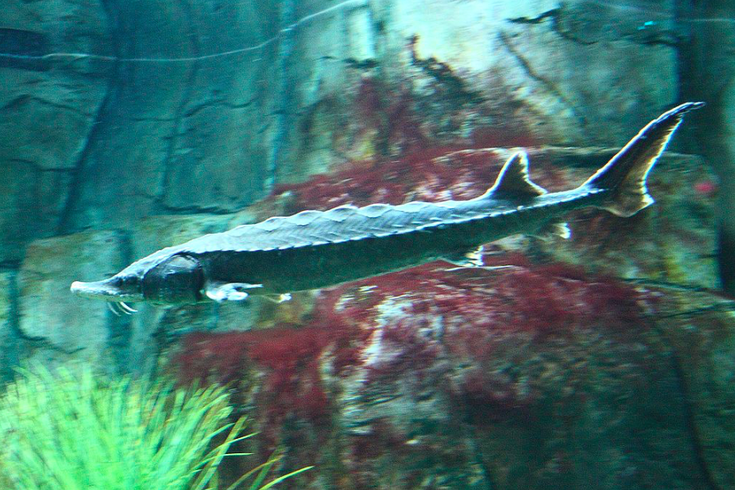 Atlantic sturgeon at Aquarium of Québec. You know summer is on its way when clinging jellyfish, stranded whales, social dolphins, bizarre carcasses and ancient-looking fish start surfacing again at the Jersey Shore. The 2018 season of sightings has begun with a bang, according to a report published Thursday by NJ Advance Media. A woman taking a jog along the sand at Island Beach State Park stopped in her tracks when she spotted a spiky beast of a fish whose remains had been washed up in the surf and left in the sand. The woman thought at first sight it might have been some kind of alligator, but the National Ocean Atmospheric Administration reportedly confirmed the fish was likely an Atlantic sturgeon. The evolution of the sturgeon dates back more than two million years ago to Earth's Triassic period, which gave root to a lineage of 27 species of the fish. New Jersey is home to Atlantic and shortnose sturgeon, both of which are considered endangered. A spokesman for the New Jersey Department of Environmental Protection said it's rare for such animals to wash up at the Jersey Shore. The woman's surprise to find a sturgeon — characterized by bony plates called scutes — was wholly justified. That's going to be hard to top in the coming months. Ideally, we'll see more animals rescued than found too late.